Pew Research Center’s final 2010 pre-election survey finds the Republican Party continuing to hold a solid lead in preferences for Tuesday’s midterm elections. The poll, conducted Oct. 27-30 among 2,373 registered voters, including 1,809 voters considered the most likely to vote, shows that 48% of likely voters say they will vote for the Republican in their district, compared with 42% who favor the Democratic candidate. These results suggest little trend in voter opinion nationwide and they track results of a Pew Research Center poll conducted two weeks ago. That survey found the GOP holding a 50%-to-40% lead among likely voters. This is the third consecutive poll since September finding a significant Republican lead among likely voters. The size and consistency of the probable Republican margin suggests that the party will win a large enough share of the popular vote nationwide to recapture control of the House of Representatives, barring a remarkable last-minute Democratic surge. A party’s share of the popular vote and the number of seats it wins has been highly correlated in recent midterm elections. In addition, the poll finds that the judgments of voters who are still uncertain or undecided do not favor either party. 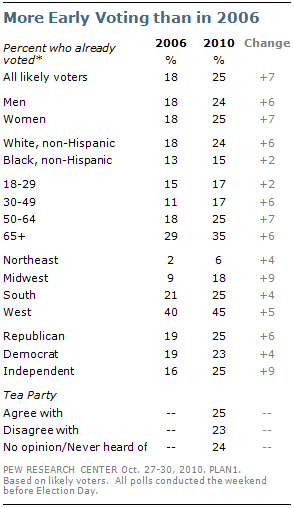 About as many likely voters say they lean toward a Republican candidate as toward a Democrat (3% each). And an analysis of undecided voters — 7% of all likely voters — shows no clear signs of their likelihood of favoring one party over the other by a significant margin. Many of the patterns apparent throughout the 2010 campaign remain clearly evident in its final days. First, the Republicans enjoy a substantial engagement advantage. The GOP’s overall lead is only evident when the sample is narrowed to likely voters. Among all registered voters, preferences are about evenly divided — 44% Democrat, 43% Republican. This represents one of the largest gaps in preferences between all voters and likely voters ever recorded in Pew Research Center surveys. As was the case earlier in the campaign, this is more a consequence of unusually high engagement among Republicans than disengagement among Democrats. Since September, a growing number of Democrats say they have given a lot of thought to the election, but they still lag Republicans by a wide margin. The current levels of Democratic engagement are fairly typical for a midterm election, though they are somewhat below what they were in 2006, when the party regained control of Congress. Second, the engagement gap notwithstanding, the Republicans owe much of their lead to strong backing from independents and other non-partisan voters. As in previous polls, likely independent voters favor GOP candidates by a wide margin — currently, 45% to 32%. 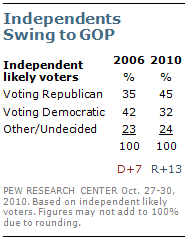 Shortly before the 2006 election, independents backed Democratic candidates by a 42%-to-35% margin. Third, compared with 2006, the GOP has made gains among many segments of the electorate, but especially men, voters ages 65 and older, and whites. The Democrats hold substantial leads only among African Americans, younger voters, those with low family incomes, union households and the religiously unaffiliated. The job situation continues to be the dominant issue in 2010. Nearly four-in-ten likely voters (38%) say the job situation will be most important in their vote, compared with 24% who say health care will be most important and 19% who cite the deficit; just 7% of likely voters say either the situation in Afghanistan (4%) or terrorism (3%). The deficit and health care rival jobs as the top voting issue for Republicans; among Democratic and independent likely voters, far more say jobs will be most important than say any other issue. The pre-election survey indicates that overall voter turnout is likely to be as high this year as in 2006 – when 40% of age eligible voters cast a ballot – and higher than in previous midterms. Reflecting the growing popularity of early voting, 25% of likely voters say they have already voted, up from 18% in the final survey four years ago. Among those who have already voted, 49% say they have voted for a Republican candidate, while 41% have voted for a Democrat. In the final weeks of the campaign, there are no signs that the large engagement gap favoring the Republican Party has narrowed. Republican voters continue to be far more likely than Democrats to say they have given a lot of thought to this year’s election (70% vs. 55%); more Republicans than Democrats say they are more enthusiastic than usual about voting in this year’s congressional election (61% vs. 41%); and Republicans are eight points more likely to say they are following campaign news “very closely” (39% vs. 31%). These measures suggest that overall turnout is likely to be as high this year as in the 2006 midterm elections. Among registered voters, 59% say they have given a lot of thought to this election, comparable with the 61% who said this in the closing days of the 2006 campaign, and higher than the 52% and 49% who said this in 2002 and 1998, respectively. When it comes to campaign news, 34% are following very closely, again comparable with 2006 (33%) and substantially higher than in previous midterm elections. 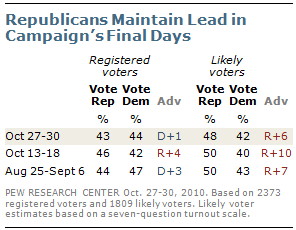 On many measures, the Republican engagement in 2010 is surpassing long-term records. Fully 70% of Republicans have given a lot of thought to this election, the highest figure recorded among either Republicans or Democrats over the past five midterm election cycles. 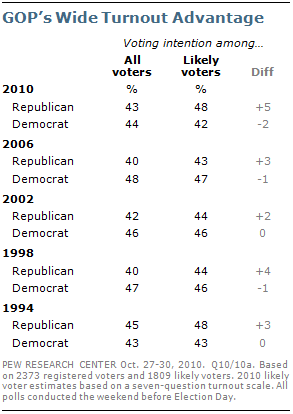 And the differential between Republicans and Democrats is larger than ever previously recorded. Because of this large engagement gap, the likely electorate is skewed toward voting blocs that favor the GOP. While 16% of all registered voters are younger than age 30, this age group makes up only 8% of likely voters due to their lower levels of interest and commitment to voting. Similarly, lower income Americans, who tend to favor the Democrats, make up a smaller share of the likely electorate due to their lower engagement levels. These patterns are not unusual; in most election cycles, turnout tends to be lower among a number of voting blocs that favor the Democratic Party. For a full profile of registered and likely voters in previous midterm election cycles, see people-press.org. The economy has dominated much of the campaign debate this fall, but it is not the only issue on the minds of voters. Asked to choose among a list of six issues, 38% of likely voters selected the job situation as the most important issue in their vote. Nearly a quarter (24%) selected health care, and 19% picked the deficit first. Immigration (at 6%), Afghanistan (4%) and terrorism (3%) trailed the top three. Among Republicans, comparable percentages cite the job situation (30%), the deficit (27%) and health care (25%) as most important. Among Democrats, jobs clearly tops the list (at 47%), but health care is cited by 28% as most important to their vote. Health care is cited by a 53%-majority of voters when given the opportunity to cite two issues. The job situation remains the most frequently cited issue (at 62%). 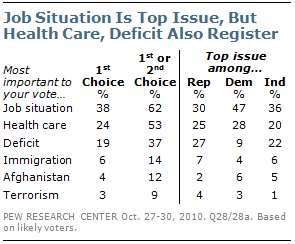 The deficit is mentioned by 37% of voters as one of the top two issues. Voters who cite the job situation as a top issue tilt toward the Democratic candidate for Congress (49% Democratic, 42% Republican). Those who cite health care are nearly evenly divided in their vote preference (47% Republican, 46% Democrat). But those who cite the deficit as one of the top two issues are voting Republican by more than two-to-one (63% Republican, 29% Democrat). The relatively small percentage of likely voters who cite immigration and terrorism as top issues also tip heavily in a Republican direction (65%-28% Republican among those citing immigration, 55%-37% among those citing terrorism). 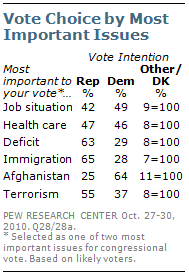 Voters who see the situation in Afghanistan as a top issue are voting Democratic by a 64%-to-25% margin. In what has turned out to be a nationalized election, about six-in-ten voters (62%) say that which party controls Congress will be a factor in their votes this year. More than half (54%) see their vote as a referendum on Barack Obama — but those people are divided; 28% see it as a vote against Obama, while 26% see it as a vote for the president. And a plurality (35%) say that national issues — as opposed to local concerns or a candidate’s character and experience — will make the biggest difference in how they vote. These numbers have changed only slightly in recent months. 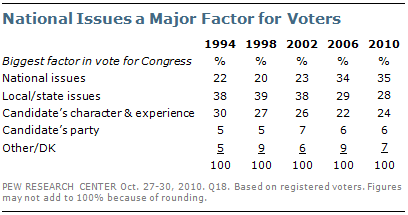 The 62% who say that party control of Congress will be a factor in their votes nearly matches the 61% of registered voters who said this in 2006. 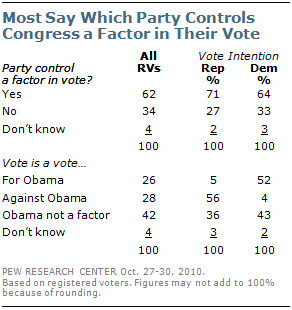 Just before the 2002 midterms, about half (48%) said party control would be a factor. This year, 71% of those planning to vote Republican say party control will play a role in their votes, while 64% of those planning to vote Democratic say the same. More than a third of voters (35%) say national issues will make the biggest difference in how they vote; 28% say local issues will and 24% say a candidate’s character and experience will. Those numbers are comparable with 2006, another highly nationalized election when control of Congress was in play. In 1994, however, a 38%-plurality said local and state issues were the biggest factors, 30% said a candidate’s character and experience were and just 22% named national issues as the biggest factor. Currently, 44% of those who plan to vote Republican say national issues will be the biggest factor, compared with 30% of those who plan to vote Democratic. A plurality of independents (35%) also say this. In 2006, 38% of those planning to vote Democratic said national issues would be the biggest factor; 32% of those who planned to vote Republican said the same. While just more than half say they see their votes as a statement about Obama (26% for, 28% against), about four-in-ten (42%) say the president will not be much of a factor in their votes. More than half of those planning to vote Democratic (52%) say they view their vote as a vote for the president, while 56% of those planning to vote Republican see their vote as a vote against Obama. 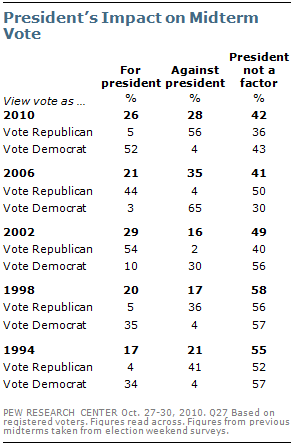 In 2006, during Bush’s second term, about two-thirds of those planning to vote Democratic (65%) said their vote was a vote against the president; just 44% of those planning to vote Republican said their vote was a vote in support of Bush. 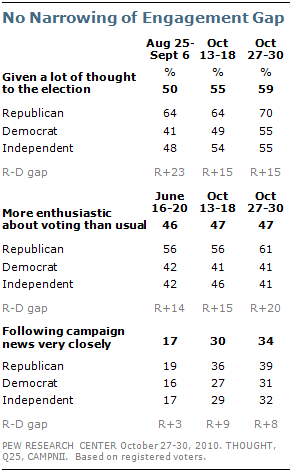 As has been the case throughout the 2010 campaign, voters express high levels of anti-incumbent sentiment. 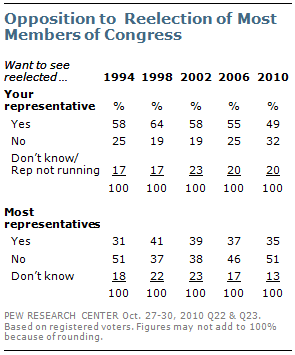 Nearly a third (32%) say they would not like to see their own member of Congress reelected, and 51% say they would not like to see most members reelected. On both measures, levels of anti-incumbent sentiment are as high as in any midterm election cycle dating to 1994. Opposition to incumbents runs particularly high among Republican voters. Three-quarters of Republicans (75%) do not want most members reelected and 40% do not want their own member returned to office. Far smaller percentages of Democratic voters say they do not want to see most members (25%) or their own member (19%) reelected. Independent voters track closer to Republicans with 58% preferring that most members are not reelected and 38% saying they would not like their own representative to retain their seat. On the eve of the election, most voters say they have been contacted by candidates or political groups this season. About eight-in-ten (79%) report having received printed mail from candidates or political groups and six-in-ten (60%) say they have received pre-recorded telephone calls about the elections. Smaller percentages report having been contacted by a live person talking about the elections either over the telephone (31%) or in person at home (19%). About a quarter say they have received email (27%) and 5% say they have received a text message from political groups or candidates. In addition to direct contacts, majorities say they have seen or heard a lot of ads on behalf of both Republicans (57%) and Democrats (53%). Campaign outreach has intensified over the last few weeks, as more voters report getting mail, and receiving both pre-recorded and live calls than they did two weeks ago. And compared with this point in the 2006 election, more voters are reporting contact over email (27% today, up from 14% then), in person (19%, up from 15%) and over the phone. In 2006, 50% reported receiving phone calls; today, 65% report receiving either an automated (60%) or a live call (31%). In the last few weeks of the campaign, outreach has intensified for Republicans, Democrats and independents, but Republicans are more likely than other voters to report having received printed mail or pre-recorded telephone calls. While seven-in-ten Republicans (70%) say they have received robocalls about the election, that compares to substantially smaller majorities of both Democrats (56%) and independents (57%). And although 77% of Democrats and 78% of independents say they have received printed mail, 83% of Republicans have done so. 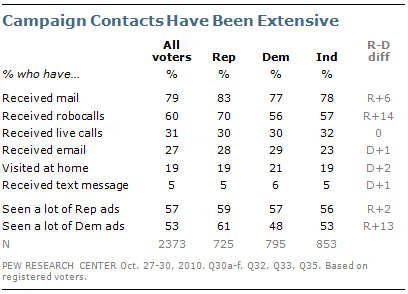 There are no significant partisan differences in other forms of direct campaign contact. Roughly one-in-four (25%) likely voters say they have already voted. This is up from 18% in 2006. Reflecting the variation in voting rules in different states, early voting intentions vary by region. As was the case in 2006, far more voters (45%) in the West than in other regions have already cast their ballots. A quarter (25%) of voters living in the South have already voted. Only 18% in the Midwest and 6% of in the Northeast have already cast their ballot. There also are differences in early voting by age. Roughly a third (35%) of voters ages 65 and older have already voted, compared with 25% of those ages 50 to 64 and only 17% of voters younger than age 50. In 2006, voters older than age 50 also were more likely to vote early. There are no differences in early voting by gender or party. But nearly a quarter (24%) of non-Hispanic whites have already voted, compared with 15% of African Americans. View detailed voter tables, the topline and survey methodology at people-press.org.